Very few modern products are considered game changers in the collecting world. 1997 Upper Deck Legends Football earns that designation. It was truly ahead of its time and remains one of the most popular options of all-time. 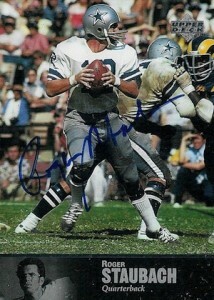 Centered on former greats, the appeal of the set is driven by on-card autographs for many Hall of Fame subjects. 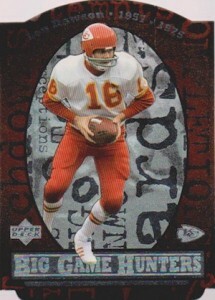 Featuring one of the more classic UD base set designs, 1997 Upper Deck Legends Football includes a full-bleed image and small text area at the bottom with a black-and-white photo. Some of the primary images are truly amazing. 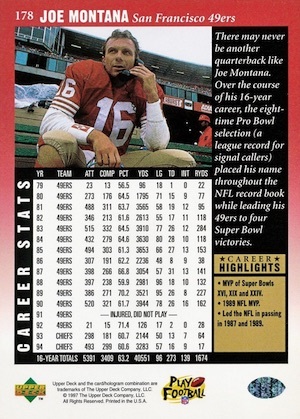 Card backs offer a detailed statistical breakdown and career highlights. Shop for 1997 Upper Deck Legends Football autographs on eBay. 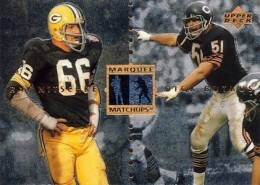 The 208-card set includes a checklist of some of the greatest NFL players in history along with two different subsets. Legendary Leaders honors ten of the most celebrated coaches in the league and Super Bowl Memories documents unique moments captured by photographer Walter Iooss. This candid look back at the Super Bowl consists of the final 30 cards. While the base set presents a great reminder the sport's storied past, the real draw of 1997 Upper Deck Legends Football is the base autograph parallel. Covering the majority of the base cards (#1-178), the on-card autograph set was originally intended to feature all the players outside of the Legendary Leaders subset. Although several players originally issued as redemptions never returned the signed cards, most of the big names are live in the release. Despite the high values assigned to many of the Hall of Fame names, the autographs are relatively easy to pull overall, averaging 1:5 packs and around four per hobby box. However, some are short prints, including many of the truly elite players. Because of this, sealed boxes are very tough to find. Also, counterfeits are also as issue because it is not difficult to pass a signed base card as a true pack-pulled autograph. The key thing to look for is the AL- prefix and authenticity on the back. 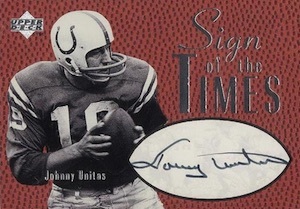 View a detailed guide to the Upper Deck Legends Autographs here, including the updates and reboots of the line. Because of the popularity of the base autographs, it is easy to overlook the other aspects of 1997 Upper Deck Legends Football. Another very notable option is the Sign of the Times Autographs. 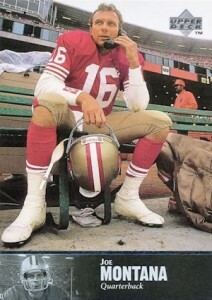 While they are much tougher to pull, the football-themed cards also command strong values. 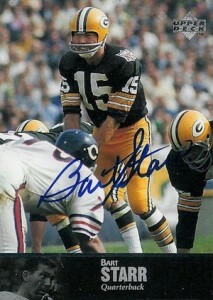 This is helped by the reported print run of just 100 copies and a ten-card checklist of some top NFL names. Several foil inserts round out the product. Big Game Hunters offers another rare option with a fragile die-cut design. Much more common, Marquee Matchups pair top players on the same card. Finally, jumbo versions of the Legendary Leaders subset are found as retail box toppers. 208 cards. Shop for base sets on eBay. LL = Legendary Leaders coach subset, SB = Super Bowl Memories subset. 168 cards. 1:5 hobby packs. Short prints (SP) are noted below. Redemptions that were never issued feature an asterisk (*). 20 cards. 1:75 packs (Hobby), 1:58 packs (Retail). 30 cards. 1:17 packs (Hobby), 1:8 packs (Retail). 10 cards. Reported print run = 100 copies.